Carnage Classic (TPB) (2016) : The serial-killing symbiote’s sadistic spree starts here! As if Venom wasn’t lethal enough, imagine what would happen if his symbiotic “other” had been joined to a murderous psychopath? 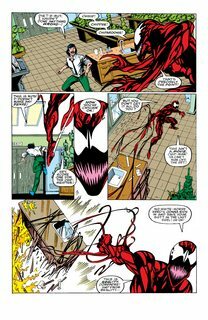 That’s where Cletus Kasady comes in, as Venom’s symbiotic spawn transforms him into Carnage, Spider-Man’s sickest foe! 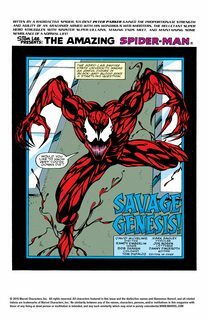 Killing on a whim, Carnage is a painful, twisted thorn in the sides of Peter Parker, Ben Reilly, Venom…even the Silver Surfer! 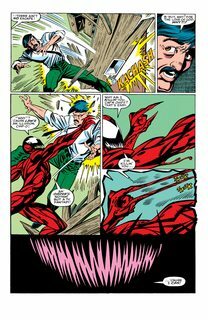 COLLECTING: AMAZING SPIDER-MAN (1963) #361-363, #410, #430-431; VENOM: CARNAGE UNLEASHED #1-4; CARNAGE: MIND BOMB; CARNAGE: IT’S A WONDERFUL LIFE; SENSATIONAL SPIDER-MAN (1996) #3; SPIDER-MAN (1990) #67; SPECTACULAR SPIDER-MAN (1976) #233; PETER PARKER: SPIDER-MAN (1999) #13; WEBSPINNERS: TALES OF SPIDER-MAN #13-14.